Charles McGee is an African-American artist living in Detroit, Michigan. He was born in Clemson, South Carolina in the year 1924. When he was ten years old, his family moved to the “Motor City” where he is living and creating to this day. McGee served in the United States Marine Corps. for three years before attending school with the aid of the G.I. Bill. Going to school opened up the world to the Detroit-based artist. He attended the College of Creative Studies and then worked for nearly twenty years as a beloved professor at Eastern Michigan University. McGee overcame obstacles just like any struggling artist. When first arriving to Detroit with his family he couldn’t read and had never seen an electric light. 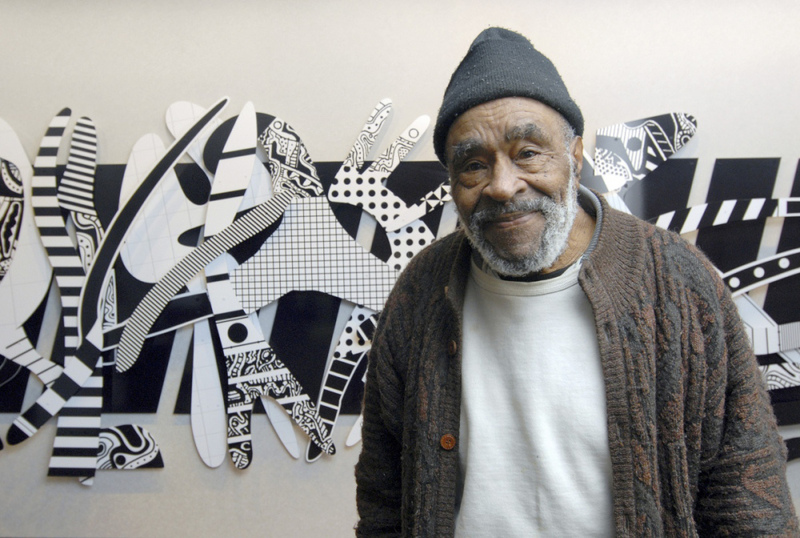 He went on to advocate for many prominent African American artists in Detroit in the late 1960’s. He opened a gallery that showed work that wasn’t being shown elsewhere, which opened the doors for many artists. McGee has an independent view of his art that is charming and inviting. “Having a show is not so much what’s it’s about for me, it’s about satisfying the need to create,” McGee states in the short documentary shared in the video below. He creates for the sake of creating and muses on the details of line, shape, color, and texture. He attributes avoiding the artist’s rut by not measuring what he does by what others think. It is only recently that this highly talented artist and teacher started experimenting with sculpture. He uses Dibond, an aluminum based material to create his signature pieces. At 86-years old he has taught himself how to use a computer to create one of the largest installations he’s made to date. His work can be seen around the city of Detroit creating a vibrant backdrop to McGee’s hometown. His pieces come together in simple lines and shapes that form to create interconnected sculptures using the rigid and metal composite material, Dibond. McGee likely chose Dibond for his medium of choice as of late due to it’s favorable qualities for mounting, printing, and withstanding outdoor applications. Many of the installations are free standing metamorphosing Detroit’s culture and street art. Additionally, the artist sculpts with sweeping curves to create his individual lines; something that Dibond delivers on through the fabrication process.